Obviously, he did not have an eraser, so he tried to make do with what he has. Surprisingly, his unusual technique worked! 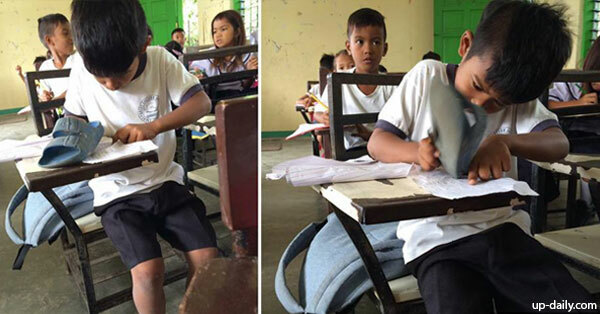 The young boy studies at Engracio M. Castañeda Central Elementary School, which is located in Barangay San Roque, La Paz, Tarlac. Incidentally, this is the same barangay that former Education Secretary Jesli Lapus once represented. Lapus is the uncle of former President Benigno Aquino III, who was also the Congressman of the 2nd District of Tarlac from 1998 until 2007. So, what do Labutong, Lapus, and Aquino all have in common? They are from Tarlac. Sadly, many young boys are still not able to go to school with complete school supplies, despite their hometown being linked to the former President and his family. These students go to school, with the desire to gain more knowledge and have a bright future. Harold Labutong use his slipper as an eraser in class. Hopefully, with the new administration under current President Rodrigo Duterte, more donations will be given to public schools so that the students can have books, chairs, tables, and other necessary amenities. Hopefully, school children will also be given bags, notebooks, shoes, and other school supplies necessary for learning. Poor but diligent students, such as Harold, deserve a good education. Their financial status should not be a hindrance for them to learn, graduate, and have a bright future. After all, these children are the future of the country. So, they should be given the best education they can have.